From Humphrey Bogart to Bette Davis, the stars of Hollywood recreated some of their most unforgettable roles in this dramatic series. A success with critics and audiences alike, this half-hour program presented radio adaptations of movies that had been nominated for or had won Academy Awards. These high quality productions often used not only the film’s original casts, but their directors as well. 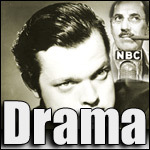 The show was first broadcast on March 30, 1946, but unfortunately the high costs of these lavish radio plays limited the show’s run to only 39 episodes.